I’ve decorated my entire home with vintage goods either passed down from family members or found while trolling estate sales or thrift stores. I am showing off different rooms of my house to display how thrifted items can be worked into the décor to be useful and inspiring items. Partially it’s because I’d love to promote my vintage Etsy shop, and partially because that’s just how I roll. I think more people should decorate their home with thrifted goods. Here’s why . Thrifted Home Tour: The Master Bedroom. 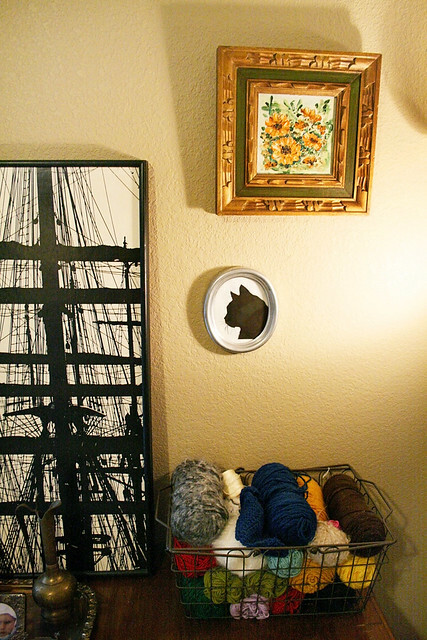 Thrifted Home Tour: The Closet. Thrifted Home Tour: The Bathroom. Thrifted Home Tour: The Dining Room. Thrifted Home Tour: The Entry, The Hall, The Laundry Room. Thrifted Home Tour: The Living Room. Thrifted Home Tour: The Kitchen. Thrifted Home Tour: The Nursery. I wish my house looked as neat and organized as yours. Mine still has an unfinished feel (lack of doors, trim, part of a wall that’s not yet painted (not repainted… it’s just drywall. and it’s in the livingroom/dining room). I can’t wait to get things on the wall and stuff. So far, we have Marc’s deer antlers, a collage of pictures of Kyra, and a few frames with our engagement photos. I want to finish a samll quilt I started years ago to hang on a wall in the bedroom. And I still need to organize the spare bedroom. And my basement is a disaster… still piles of insulation and boxes of siding. The clutter is slowly dissapearing though. No longer huge saws and tools in the dining room and I’m finding places for a lot of my stuff. The house seems a lot bigger now that the floors are finished. Dirt shows a lot more than it did with plywood, so I sweep the floors about every other day. But, it was still there with the plywood. And if I had carpet, it would all get ground in there and I hate vacuuming. Soooo glad we didn’t use any carpet. The yard is what I’m most worried about now though. Mostly with just getting through the mud to get into the house, and how muddy the dogs are going to be. But I think it’ll be great once I get plants in instead of the mud. We’ve still got piles of firewood, mulch, and dirt along the driveway too… it’s not just mud to deal with. But considering how we didn’t even start planning my house till May last year, I guess we’re doing okay. I really need to refinish the china cabinet I got a few years ago… I want to use it to store and display my yarn. I’ll still have lots of wicker baskets stored up high (away from the puppy) but it’ll be nice not to have to hide it all in bins. Most of my furniture was given to us and I’ve refinished the coffee table and my big wooden desk myself. The big wooden desk hasn’t made it to the spare room like I’d planned though… so it sits in the living room/dining room. I should take more pictures of my house, instead of talking about it on your blog, eh? Yes! I’d love to see pictures of your house, Bonnie.